Simmering antipathy between the coalition partners – Merkel’s conservatives and the left-leaning Social Democrats (SPD) – boiled over at the weekend in a row over law and order, ending any honeymoon period for the awkward allies. Germany’s Social Democrats (SPD) decisively backed another coalition with Chancellor Angela Merkel’s conservatives on Sunday (4 March), clearing the way for a new government in Europe’s largest economy after months of political uncertainty. The two groups only agreed to team up to prolong their “grand coalition” – in power since 2013 – because they were desperate to avoid fresh elections, after they both haemorrhaged support in last September’s national poll. They have achieved little since taking office last month . 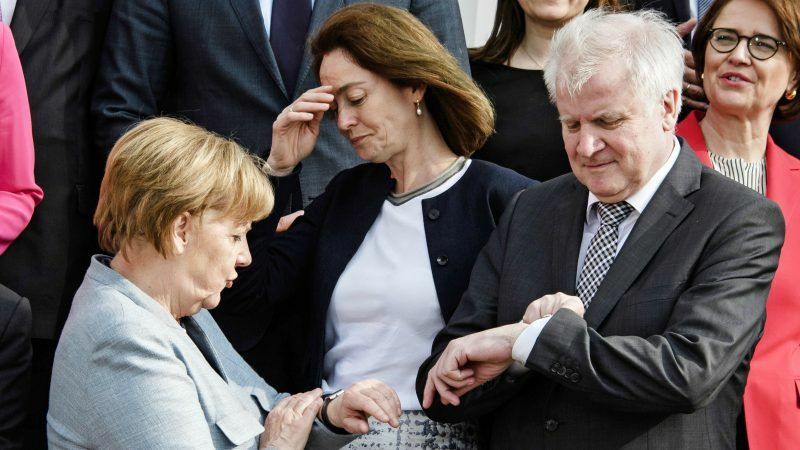 Merkel is using the meeting at Schloss Meseberg, her country residence outside Berlin, to try to end the cabinet bickering and launch a flood of reforms before the summer break. Transport Minister Andreas Scheuer said ministers made a constructive start to their talks on Tuesday. “We want to use this policy camp in Meseberg to find solutions together for the coming months to give a clear signal that the grand coalition, with this government, wants success for Germany,” he told reporters. Germany’s Social Democrats (SPD) will clash over policy with Angela Merkel in the next government, the main candidate to lead the centre-left party said yesterday (14 February), adding that the conservative chancellor was approaching the end of her career. 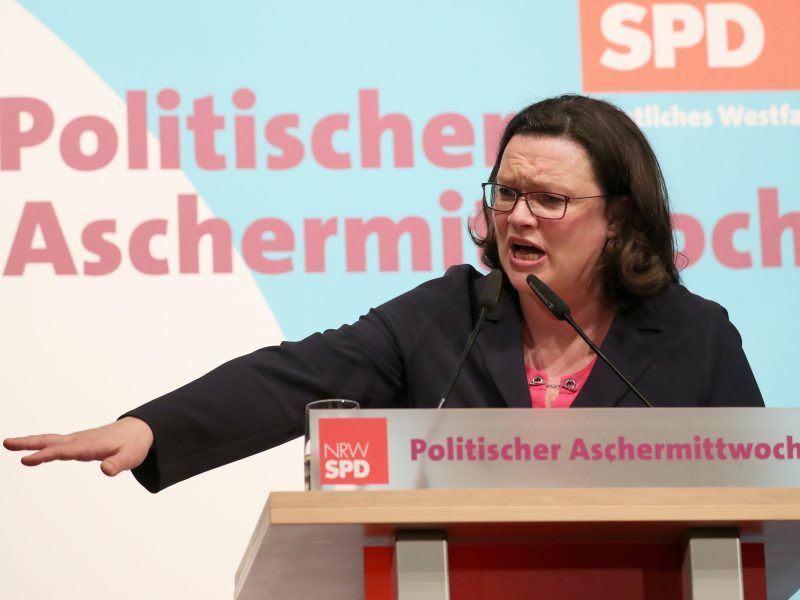 Nahles has chosen to stay outside the cabinet, instead opting to lead the SPD parliamentary group – a role that allows her both to press the government to pass reforms important to her party members and to criticise the conservatives. The pressure is on for both camps to deliver. Their coalition deal includes a clause that foresees reviewing government progress after two years – giving each the opportunity to leave the alliance if it is not working for them. An Infratest Dimap poll for ARD published on Thursday showed just 32% of respondents were happy with the government. The government situation is complicated by a regional election in Bavaria in October, at which Merkel’s Bavarian sister party, the Christian Social Union (CSU), fears losing its absolute majority if the far right makes gains. Aiming to see off the rising far-right Alternative for Germany (AfD), CSU Interior Minister Horst Seehofer said last month Islam does not belong to Germany – a comment that infuriated the SPD. Coalition sources say the art of governing in the coalition will be to find a happy medium between substantive policy work and party political skirmishes that allow the camps to differentiate themselves from each other. 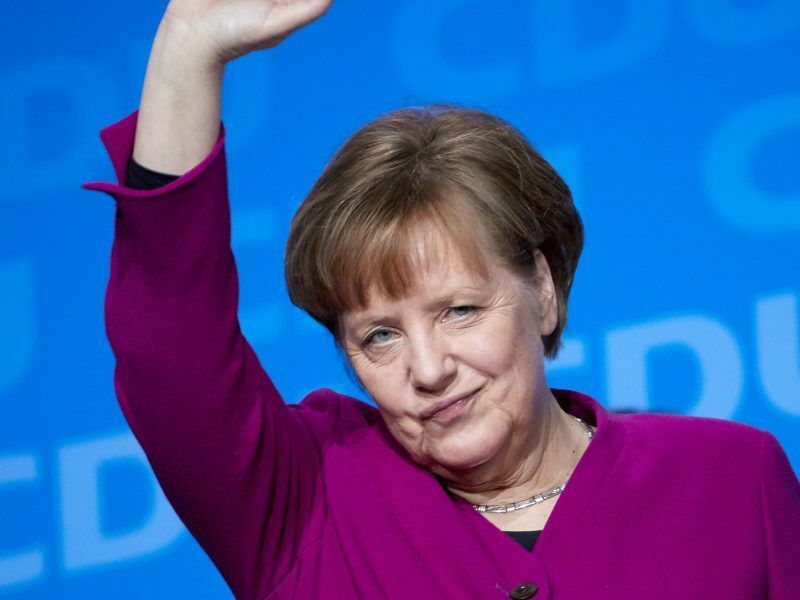 With over six months gone since September’s election, Merkel is keenly aware that voters expect the government to address their economic, social and security concerns quickly. In the past, she has used cabinet retreats as team-building exercises. NATO chief Jens Stoltenberg and European Commission President Jean-Claude Juncker joined the meeting – a way of Merkel signalling to her cabinet the importance of the biggest European Union country having a stable government.